Part 2 of my review features a day-by-day look at how the juices impacted my body and health. A juice cleanse or juice fast is when you consume fresh, preferably organic, vegetable and fruit juice for a set length of time (typically three or five days) while avoiding solid food. The juices flood your body with nutrients and detox the organs and blood of toxins that have built up over time. I got interested in juice cleansing when I learned about the Gerson Institute, which uses raw juice therapy as its main treatment for cancer, along with diet restrictions and coffee enemas. Though I don’t have cancer, the Gerson Therapy also claims to be able to heal almost every chronic degenerative disease. I don’t think I would be able to adhere to the strict dietary restrictions of the Gerson Therapy, but it renewed my interest in juicing as a means of detox and healing. Since my illnesses have an inflammatory component, I hoped a juice cleanse would help due to its alkalizing effects on the body. The Gerson Institute recommends the Norwalk Juicer, a $2500 hydraulic press-style juicer. Somehow that linked to a video clip on the two women who founded BluePrint Cleanse using a single Norwalk machine. That was the first time I’d heard of a company selling Norwalk-quality juices commercially, so BluePrint made a strong impression on me. When I began researching juice cleanse companies in earnest, reading online reviews and combing through Yelp reviews, I found that BluePrint was the biggest, most popular company. They shipped nationwide, with free shipping in New York City and the Los Angeles area. They were also one of the cheapest, at $65 per day. Their phone people are polite and courteous. Before my first cleanse, I called for advice on whether I needed a colonic, which was one of the reasons I initially hesitated about the cleanse. The representative delicately referred to “bowel movement” as a “BM,” not that I am shy about talking about that sort of thing. He didn’t think a colonic would be necessary unless I stopped having regular BM’s. The driver had trouble finding me because somehow my street address was off by a digit, but he called instead of just dropping off the juices. BluePrint has a policy that they only deliver to a live person; I’m glad they made sure it was the correct live person. If you’ve ever made your own juice, you know that it’s a lot of work to do it every day. The convenience of BluePrint cannot be overstated. When it’s time for the next juice, you just grab the next numbered bottle and drink. Their site is pretty, easy to navigate, and has lots of useful information about juicing and detox. It’s a breeze to place your order, and they keep track of every dollar spent in the form of loyalty points that you can redeem. 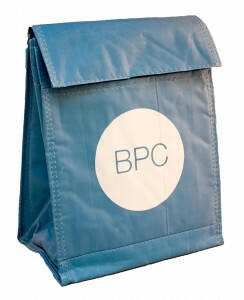 You have the option of requesting a cooler bag free with each order. The small, insulated bags are cute and useful for taking your juices on the go. The ice packs that come with the juices are reusable and fit nicely into the cooler bag. I experienced a lot of positive physical changes during the cleanse that reverberated for weeks. See Part 2 of my review for a day-by-day breakdown. This was an issue during all three of my cleanses. 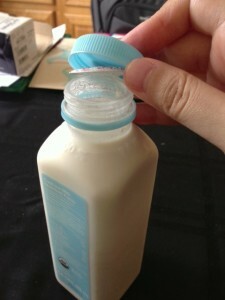 On my first cleanse (10/23/12 – 10/25/12), the three cashew milk bottles’ inner seals were partially open. BluePrint bottles have a blue plastic cap with a ring seal like gallon milk jugs–that outer cap and seal was always intact. I’m talking about the thin styrofoam-like flap that you peel off after removing the cap. I reported this to customer service on the second night of my cleanse, after opening the second and third cashew milks and finding the same problem. The guy I talked to immediately offered to refund the three cashew milks, saying, “We don’t want you to consume unsafe juice.” After noting the batch number, he suggested buying replacement cashew milk at Whole Foods. I did, only to find that the inner seal was again already loose. On my second cleanse (11/27/12 – 11/29/12), two out of three cashew milks had loose inner seals. When I took the caps off all the cashew milks upon delivery to check, one had an inner seal that came off altogether, stuck underneath the cap. I called customer service and was immediately sent a replacement bottle. The other I didn’t notice until the second night when I was about to drink it, since it had a smaller hole. I called again, and this time was asked to send some form of evidence. I emailed a photo of the open seal, though it felt weird, since it was impossible to recreate a past event. In my email, I also requested a refund for the second cashew milk. In response, I received a call from a higher-up who explained at length that the California requirement for the inner seal is expiring in a matter of weeks, and claimed that the juice is perfectly safe to drink without the inner seal. I relayed what I was told by customer service last time, especially the part about not wanting me to “consume unsafe juice.” She seemed surprised and asked for that person’s name but I didn’t remember. She assured me that the juice is fine and did not offer any further refunds or credits. We also talked about the juice that is sold at Whole Foods. 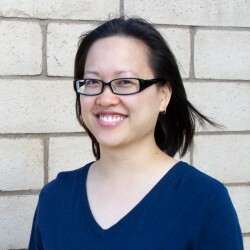 I learned that the juice that is delivered to fill online orders and the juice that is sold at Whole Foods is the same juice, made at the same production facility in Hawthorne, CA. The only difference is the packaging (cleanse juices are labeled 1-6; retail juices just list the ingredients) and the presence of an expiration date (cleanse juices are guaranteed for six days and do not have expiration dates printed on the bottles; retail juices have expiration dates printed). The expiration date issue prompted a further discussion about their bottling process. I’ve seen juices at Whole Foods with expiration dates as far out as 12 days. She explained that their juices last longer ever since they started using a special pressurization technology to squeeze out excess air. That’s why they no longer need to make the juices on the day of or day before delivery. As for the longer expiration period, she said the juices that go to Whole Foods have a shorter lead time than those delivered directly to online customers, hence the six-day guarantee. This means the juices being sold retail can actually be fresher than the juices delivered to online customers. Just check if the expiration date is further out than six days. At the conclusion of our conversation, I said that I was looking forward to my third cleanse in January 2013, and asked for her confirmation that there would be no more inner seal on any of the bottles. She said yes, the California requirement would not apply at that point and the bottles would only have the blue top. On my third cleanse (1/15/13 – 1/17/13), not only did all the bottles still have inner seals, all the cashew milks and all the #2 green juices had inner seals that were loose or broken. Since I did not expect ever to have to deal with this issue again, I did not video myself opening the bottles, nor did I open all 18 bottles for inspection upon delivery. Without live hard evidence, I did not feel I could contact customer service. I had no choice but to rely upon the BluePrint higher-up’s claim that the juice is perfectly safe to drink with or without the inner seal intact. I didn’t get sick from the juices, but I did notice a slightly sour aftertaste with the cashew milks. I should note that as of January 2013, I have not bought a retail bottle of BluePrint juice so I don’t know if the inner seal situation has been resolved. Also, I am not an industry insider, so I do not know why California is still apparently requiring the inner seal. 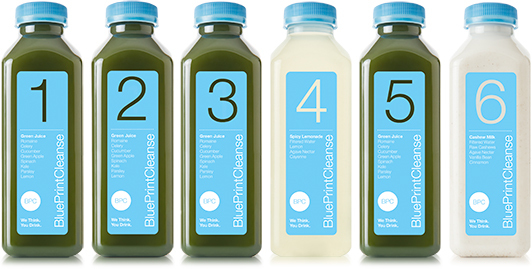 If this is your first cleanse and you want a baseline experience, I think BluePrint gets the job done. I enjoyed my cleansing experiences and don’t regret them at all. I don’t know that I would choose BluePrint again without first trying out some of the other companies out there, such as Organic Avenue, Pressed Juicery, Red Carpet Cleanse, and Ritual Cleanse. While these companies are a bit more expensive, it’d be worth it to me not to worry about sealing issues. All great info. Excellent details. Thanks for sharing! Pingback: Cute Vegetables | DIY Juice Cleanse: Worth It? !